And so t'was on a balmy Thor's Day that the Best Buy Theater hosted "An Evening With Amon Amarth." A tide of excitement has definitely risen to buoy Sweden's leading exponents of Viking Death Metal (though Unleashed may dispute that particular platitude). So much so that the band are touring by themselves to promote their latest release, Surtur Rising, and playing two sets a night: The first set featuring the album in its entirety, and the second devised of a more traditional "greatest hits" live show. It's a bold move for a band at Amon Amarth's level to embark on solo tour; clearly they (and their label, Metal Blade) have high hopes for the new release. Personally, I find the album to be unremarkable, and am not impressed by the band recycling ideas without bettering them. The exception being the epic opening track, which to these cynical ears ranks among the best that the band has released thus far. Can Amon Amarth claim their place among metal's elite on the strength of one song? If the crowd present tonight is any indication, then they've got the zeitgeist on their side; at any rate, vikings were nothing if not daring. 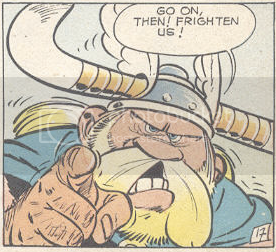 It has to be said, though, Amon Amarth hardly resemble the bloodthirsty vikings of history, and are more like the cuddly rendition seen in Asterix comics. Indeed, that explains much of their appeal to the young audience. Frontman Johan Hegg in particular is a lovable ham, happy to engage the crowd in banter about beer, beards, and the upcoming Thor movie (Amon Amarth are "very excited to see it," natch). And so the band played their newest album from beginning to end, to the initial delight of their adoring audience. I was hoping that Surtur Rising would be more appealing live; it's not, and the crowd's enthusiasm noticeably lagged midway through the set. But after a short "beer drinking" break, it became clear what those assembled really wanted to hear: the second set (drawn mostly from the previous two albums, With Oden On Our Side and Twilight of the Thunder God) sent the assembled faithful into full-on madness; one dude at my side even had tears streaming down his face (bonus points to the kid who dressed up as Thor and raised his plastic hammer during every song break). Disappointing album aside, it's hard not to root for these guys; as Hegg pointed out, they're coming up on 2 decades as a band, and have attained success the right way, through endless touring, hard work, and mutual love between fans and band. These guys have built up enough momentum over the last 5 years that even a dud release couldn't stop them. And it's not like they'd even hear critics like me over the roaring approval of their thousands of new fans.